Birthdays are a time for celebration, toddler birthdays especially. Reflecting on the day you brought your new bundle home. Reminiscing about all of their milestones in between. As parents, we can run out of creative ways to acknowledge this special time. If you read my post on Party Planning, then you know we’ve decided to take an oath of “Being vs. Buying.” This year, we took our celebration on the road to LEGOLAND Florida in celebration of our son’s fourth birthday. Both of my sons seem to be Lego-obsessed these days and while I had been collecting ‘pins’ for Lego party planning for over a year now, I decided to give them the real thing live and in person! What better way to create fun memories! And now I have some LEGOLAND Florida tips and tricks. Besides, it’s LEGOLAND. A theme park built completely on the creativity and imagination of Lego masters is a no brainer! Modern Boca Crunchy Mom is all over it! Legoland does NOT disappoint. This is THE perfect family attraction. An all access park for kids of all ages. I was amazed there wasn’t a single ride that the boys could not get on. The folks at Legoland know how to cater to all family types. I sat and watched as mixed ages were running, jumping and playing together at each attraction. Each ride entrance had play areas set up for the kids to occupy themselves with Legos, while all the parents waited in line for the ride. That’s right, no standing in line in the blistering heat trying to hold your screaming kid with wailing arms and explaining to them (a three year old) why you can’t just plow through all the people ahead of you and grab the first seat on the “choo choo” made entirely of Legos. I cannot explain how many grateful parents there were greeting you at every entrance. 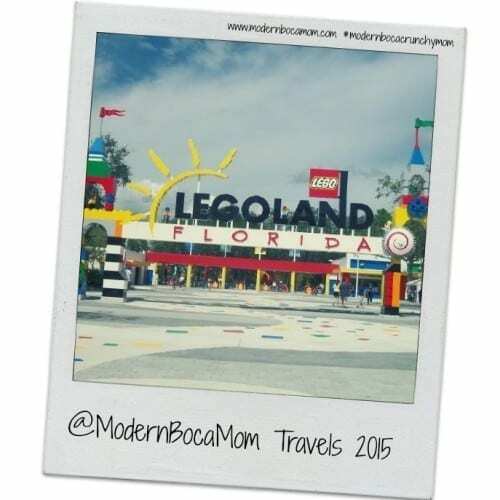 LEGOLAND Florida Tips: We never waited more than ten minutes at each attraction. One of the plus sides (there were so many) of this park was that there weren’t a lot of battery operated, “light up” distractions for the kids. There were, however, tons of incredibly artistic and detailed structures completely made of Legos that we were all blown away at the sheer genius of it all. All of the food options were great. We stopped and ate at almost every station (also set up with building blocks for the kids while you waited for your food). I must admit the Apple Fries were the biggest hit of all– if you get the chance, you have to try them! 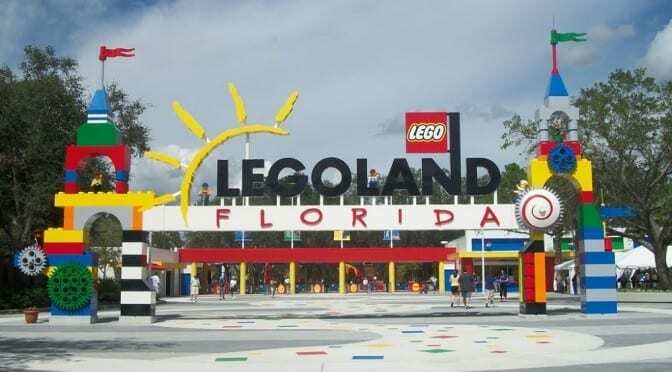 LEGOLAND Florida Tips: We stayed in a hotel not too far away and decided to have a little pizza party of our own with music, dancing, cake and plenty of silly string. Things got a little wild. Add this together with a late bedtime and it’s a night and weekend to remember. The trip was a success. After all, the boys are still talking about it. Erika is a Write-at-Home Mom of two boys Evan & Nate. A self professed Bookworm and Advocate for Play. She created a blog called Essentially Erika that focuses on All Natural Parenting, Life, Nature and all things Organic. Follow her journey to getting back to basics and discovering what’s essential. You can follow Essentially Erika on Facebook, Instagram & Twitter.